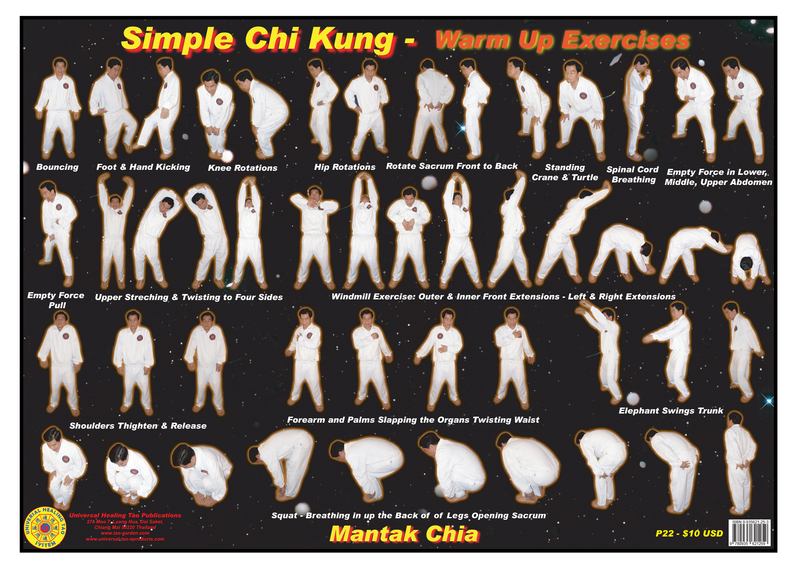 This poster illustrates Master Chia in standing exercises of Simple Chi Kung Postures that include Bouncing, Foot and Hand Kicking, Knee, Hip and Sacrum Rotation, Standing Crane and Turtle, Spinal Cord Breathing, Empty Force, Windmill Exercise, Trunk (Arm) Swinging, Shoulder and Forearm Rotation and Twisting, and Sacrum Squatting. The Simple Chi Kung formulas of the Universal Healing Tao awaken the body's organs and joints for your daily meditation and Chi Kung practices while you are lying in bed to activate your morning bowel movement and opening your body up for your daily activities. Once you get up and relieve and clean yourself you can start in a standing position to open the rest of your body's joints with the Simple Chi Kung formulas (Bouncing, Foot and Hand Kicking, Knee, Hip and Sacrum Rotations, Waist Loosening, Crane and Turtle, Spinal Cord Breathing, Empty Force, Side Twisting, Windmill, Eye Exercises, Neck, Shoulder, Wrist and Hand Stretching, Palm Slapping, Door of Life Opening, Elephant Trunk Swing, Squatting, Teeth Tapping, Chi Self Massage, Bone Breathing and Laughing Chi Kung).